Our highly experienced team of garage door repair specialists have dealt with every possible problem your system could suffer from. Springs in particular, being a major part of these complex mechanisms, can experience a fair share of issues. They are the components that allow the door to open and close safely, and since they are therefore bound to go through some wear and tear over the years. When they become too damaged, it can be extremely dangerous to handle them, or to even use your garage door safely. That's when you need to give our company a call. 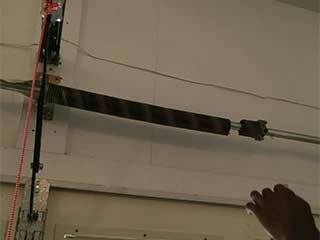 These are the two main types of garage door springs out there. The extension type, which is the older variety, stretches and contracts in order to help your door close or open. The nature of this action makes extension springs more susceptible to go whipping around your garage when they snaps, which makes them more dangerous than their counterparts. The torsion spring is the more modern variety. I's purpose is similar to the extension one, i.e. to help your garage door maneuver up and down. However, as its name suggests, it uses torsion rather than extension to achieve this goal, which means that rather than stretching and contracting, the torsion spring twists and unwinds. Therefore, it is also considered to be the safer option, as it will be much less likely to go flying when/if it snaps. Apart from proper lubrication and inspection, there is something else that our skilled experts can do to make sure your springs are in top shape, and that's – tension adjustment. It's crucial that these components operate under the correct amount of tension, otherwise your door could start tilting, or worse, collapse altogether and potentially damage yourself or your property. For any spring related issue, or for some proper maintenance work that'll make sure these dangerous components keep functioning properly, call our Garage Door Repair Layton team today!